Recent killing of Superintendent Peshawar leaves a big question mark on so called "safe city" projects as well as the competency of administration. This is nothing but simple case of we have two characters in law-enforcement forces and the fruit or reward you get for being a Rao Anwar or being Tahir Dawar. 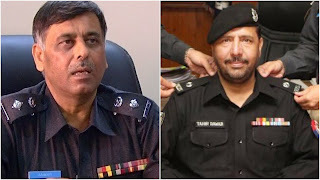 Rao Anwar wins hands down - Yes. you be a uniformed goon and nobody will touch you, even the highest judge of the country will not only release you bail but unfreeze all your bank accounts and declare your house as Jail. This is the privilege you have for being part of mafia while being in uniform. You're the judge, jury and executioner and even if you end up being caught red handed nothing shall be done against you.On the other hand if you're honest, upright officer who protects the locals and takes on the terrorists then you shall be made example out of. Even your own government will refuse to comment on your death and anyone asking questions or raising voice will have their noose tightened. The affect it will have on the morale of law-enforcement forces as well as on mind of a layman on street can be nothing but negative and to make it worse we are actively discouraging the truth seekers. Our Government however is totally mute on this issue as it's a very "sensitive issue". Indeed it's better for all Govt officials to stay muted as they will only worsen it by rubbing salt into wounds of relatives of Tahir Dawar. Not so long ago we had a hashtag trending on twitter #chaudhryaslamkhan. An SSP killed in bomb attack who also was known to be a real tough cookie for the terrorists in Karachi. So many deaths that all of these equate to nothing but statistics now, it's like we going numb.